Brandon University (BU) is preparing to host Indigenous Awareness Week. 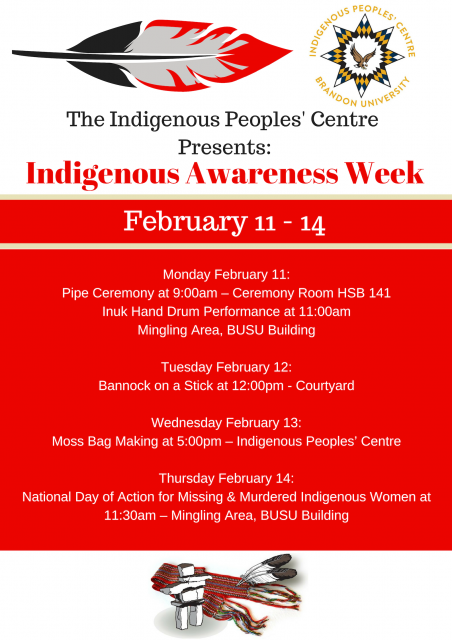 The Indigenous Peoples’ Centre (IPC) at BU has planned a series of cultural events that are open to everyone. On Monday, Feb. 11, the week will begin with a pipe ceremony at 9 a.m. in the He Oyate Tawapi Ceremony Room in the Dr. James & Lucille Brown Health Studies Complex. Following that will be an Inuk drum performance at 11 a.m. in the Mingling Area of the Knowles-Douglas Students’ Union Centre. The Tuesday, Feb. 12 activity will be cooking bannock on a stick at noon in the Kavanagh Courtyard. A moss-bag making workshop at 5 p.m. in the IPC will highlight Wednesday, Feb. 13. The workshop, which is limited to a maximum of 15 participants, is a joint presentation of the IPC and the Brandon University Aboriginal Student Collective. 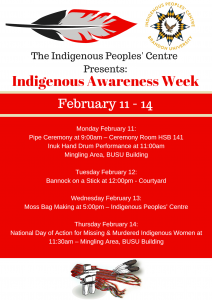 On Thursday, Feb. 14 an event will be held in commemoration of missing and murdered Indigenous women. Beginning at 11:30 a.m. in the Mingling Area, the event will include prayers, an honour song and candlelight vigil. A dreamcatcher workshop will follow the vigil. Thursday will also feature a Paint Night with BU Fine Arts graduate Jessie Jannuska, although that event, which is presented in conjunction with the Brandon University Human Resources Office, has already been filled. So that all may enjoy the events, please contact Tina Cook-Martin in advance at 204-727-7458 or CookMartinT@BrandonU.ca with any accessibility considerations. More information on Indigenous Awareness Week at BU can be found at BrandonU.ca/IPC.